ERC funding started only in 2007, with schemes to support early career or more advanced researchers in the EU member and associated countries. These grants are already well known in the research community and have become a flagship of EU research funding and also a significant impulse for the awardees. The main goal of the program is to support frontier research in the EU, that is, research “at and beyond the frontiers of understanding progressing in new research areas and characterized by the absence of disciplinary boundaries”. The consensus is that this kind of research, although an intrinsically risky venture, is key for long-term scientific and technological success and building the next generation of scientists, and one can derive that basic research in science and technology is of critical importance to economic and social welfare. ERC has received over 43,000 project proposals for its calls up to 2013, and the average success ratio is just over 10%, but in reality it has been going down the last years. The awardees experience a very competitive and thorough selection process, and academic institutions are very happy to have them as a verified source of quality research. This has resulted in very interesting flows of young researchers in between EU countries. For instance Prof. Manuel Salmerón-Sanchez moved from Spain to Glasgow to start his 2012 ERC Grant, and so have done many other researchers in search of better conditions for their rising research careers. Why and how is this happening? Is it really happening everywhere? Before rushing to conclusions, we should have a closer look at the numbers. The ERC has published the full list of grantees and more recently statistics by country of host institution and grantees (visit their online library for full access to the documents). Fig. 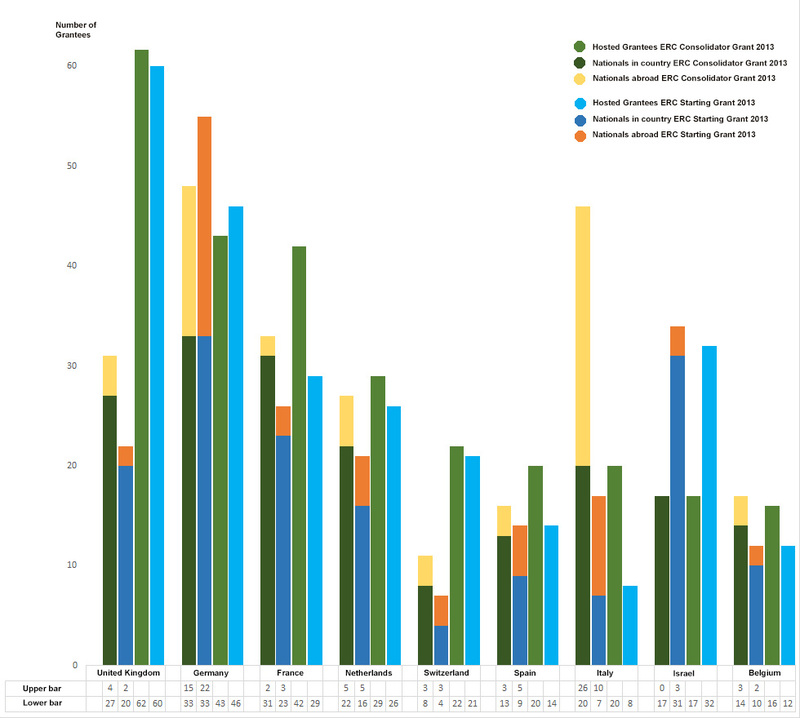 1: Statistics of ERC Grants 2013 Call. Size of bubbles is number of grantees abroad for each country. For the 2013 Starting and Consolidator Grants there are several striking differences between countries. The United Kingdom and Germany have received the highest number of grants (see Figs 1 and 2), but seem to have quite a different source of researchers to fill those grants, as more than half of the grantees in the UK are not UK nationals. Many nationalities, UK included, have a very low proportion of grantees abroad (see Fig 2) with the notable exception of Germany, and more strongly Italy. Germany has an interesting balance between foreign researchers coming in the country with an ERC grant and German nationals going abroad. Italy is quite an odd case in the whole EU. Other countries such as The Netherlands and Spain have a noticeable amount of researchers going abroad with their ERC grants, but nothing compared to Italy. Italy had more ERC grantees abroad that in the country in 2013, or said in a more striking way, if you are Italian and received a ERC grant in 2013, you are more likely to do your future work abroad than in Italy. Fig. 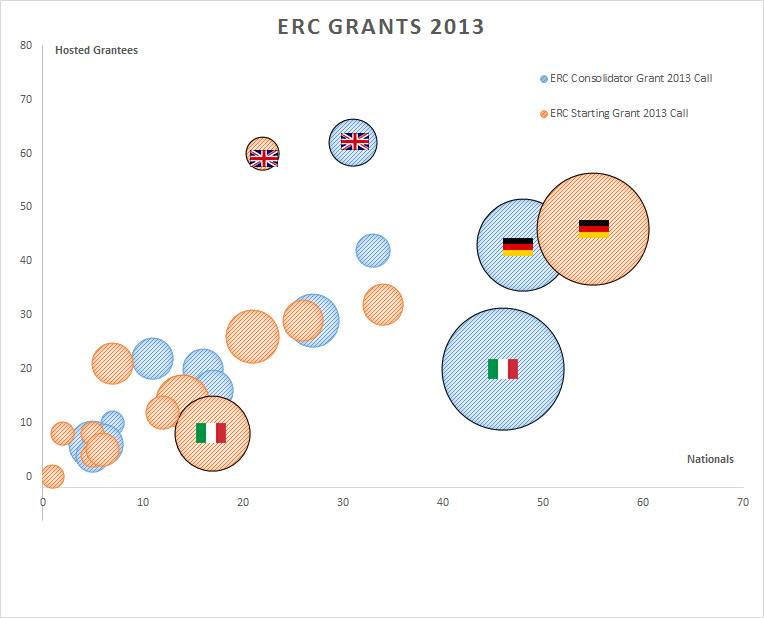 2: Statistics of ERC Grants 2013, details by country. The numbers for the ERC Starting Grant 2014 were published a few weeks ago and confirm all these trends for the bigger countries, you can check them here. The driving forces of theses movements of research capacity are complex and very probably not uniform through the EU, as the research environments and researchers in every country have their own characteristics that make them fitted or not for the ERC calls. Giving an accurate description of these driving forces is out of our scope here, but these statistics could be a part of a broader analysis with insights in how the different countries foster and rip the fruits of research.